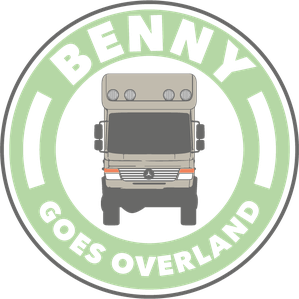 Benny goes overland - Travelling around Europe and preparing our PanAmericana adventure with our Mercedes Vario 4x4 expedition vehicle. "Go on an extended traveling? Later." It took some time to recognise: Life is too short for "someday". It makes no sense to sit in a comfortable chair in front of your desk and to follow all these vloggers on Youtube on their adventures. We want to create our own travel story. So after more than 30 busy years on the job we are now considering another way forward: See as much of the world as possible! Traveling, meeting interesting people and enjoying good food is our main focus. Having travelled many countries by motorbike, the idea was born in 2015 to build an expedition vehicle. In 2018, after a waiting and building time of 2 years, our Benny (an expedition vehicle based on a Mercedes Benz Vario 4x4) was ready for the road. We decided for a Vario due to the high payload, making a spacy and comfortable cabin possible. Furthermore the Vario has a good drivability and the technology is very robust. Furthermore the Vario has good offgrid capabilities, so we can go off the beaten paths. We documented the conversion process of our expedition vehicle on this website. We also use social media to document our travels from time to time on Youtube, Instagram and this website. Recently made two videos about our preparations for Iceland and about our separating toilet.